The Sam and Adele Golden Foundation for the Arts was conceived as a way to thank the community of artists for their support, encouragement and friendship. For the Golden family and friends, the Golden Foundation is also a means of celebrating the legacy of Sam and Adele. 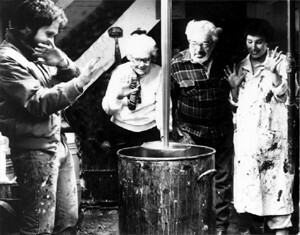 Sam Golden began his paint-making career in 1936 at Bocour Artist Colors, a company he co- owned with his uncle, Leonard Bocour. Sam and Leonard began by producing hand-ground oil colors for artists in Manhattan. It was a very exciting time in the arts, as the New York School of Painters was rising to prominence, and New York was becoming the art center of the world. Artists like Willem de Kooning, Barnett Newman and Morris Louis were regular visitors at the Bocour shop on 15th Street. Artists would set up their drawing pads or easels and draw or paint in the tiny shop. It was Sam’s work directly with artists and the products he developed in collaboration with these painters that became the inspiration for his entire paint-making career. Sam, the specialist and inventor is credited with the development of the first artist acrylic paint, the first iridescent artist colors, the first stable alizarin color in acrylic, the first stable zinc white in acrylic, and the development of water tension breaker. After 35 years as a paint maker, Sam retired from his partnership at Bocour Artist Colors. 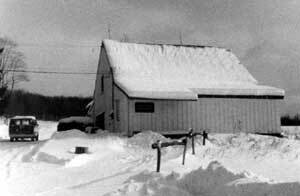 He and his wife, Adele, bought a farm in upstate New York, in the small village of Columbus. After trying retirement for seven years, and at the age of sixty-seven, Sam decided to go back into the business he loved, making paint for artists. Adele, the consummate business woman, supplied the financial and organizational acumen to both support her husband’s life’s work and to realize her own dream of starting a Golden family enterprise. Thus began the formation of Golden Artist Colors, Inc. 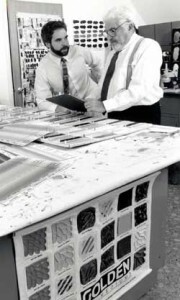 In 1980, Sam invited his son, Mark, to join with him in the formation of the new company, Golden Artist Colors, Inc.
From its earliest days, the mission of Golden Artist Colors was to grow a sustainable company dedicated to creating and sharing the most imaginative and innovative tools of color, line and texture for inspiring those who turn their vision into reality. 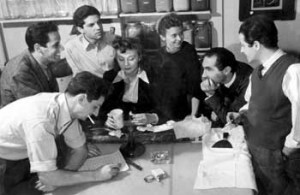 To accomplish this mission, Sam and Mark would visit artists every week in Manhattan, showing them products and asking artists, “How do you work?” Through this dialogue new products were developed and brought to the artists for experimentation. Word quickly spread of a new company that would customize products for professional artists. The product line that began with just 36 colors and five mediums quickly expanded, all generated by the needs of professional artists like Helen Frankenthaler, Ken Noland and Roy Lichtenstein. Sam’s rebuff to any technical dilemma was, “Don’t tell me it can’t be done, just get out of my way and let me do it!” And Sam did get it done. Since 1980, his company developed over 1,000 custom paints for artists, conservators, and many individuals and businesses requiring the special services of custom coatings. It is no surprise that Sam’s company is the benchmark by which all other brands are measured. Golden Artist Colors’ commitment to the original tenets of Sam Golden — to listen to the creative customer and to be the best resource for artists in the world — remains strong and constant. Members of the Golden Family have created The Sam and Adele Golden Foundation to commemorate their parents’ legacy and the innovative traditions of Golden Artist Colors, Inc.